As a parent, the bustle of modern life can easily take its toll. Because mums and dads are often busy with work, kids have club commitments left, right and centre, and there's little help from (also busy and/or far away) family and friends, fun often comes second to chores, homework and life admin. Rushed school runs, pressures from the office and general parental guilt can cause a world of stress. And it's easy to let that bubble up inside. This might surprise you, but boxing can be a big stress-buster for the whole family. "It's a unique type of fitness, because it has such a huge element of mental strength, alongside physical training," says Marcellus Baz BEM, founder and MD of Nottingham School of Boxing (nottinghamschoolofboxing.co.uk) and its sister organisation, Switch Up (switch-up.org.uk). "This makes it amazing for getting rid of stress - you aren't just using physical force, you're learning how to deal with mental challenges, train with others in the class as a team and even evaluate and overcome opponents. "It's suitable for anyone, from any background or skill level. We start classes from age five. "Boxing isn't all about being in the ring, punching and being punched - its foundations are in discipline and being measured and controlled, which are really valuable skills and all tie to how you face and overcome stresses in life. Younger kids love activities like skipping and using the punchbags. "Parents love knowing their kid is doing something that's good for them physically, but also really good for their mental attitude, especially when they get into the teenage years. "Boxing requires courage, confidence and dedication, which are amazing attributes for adults and children. "Mental strength definitely helps with dealing with everyday stress and wellbeing - it means you are both physically and emotionally strong." Full-on family meditation might seem a bit overwhelming, but it's definitely worth a try. 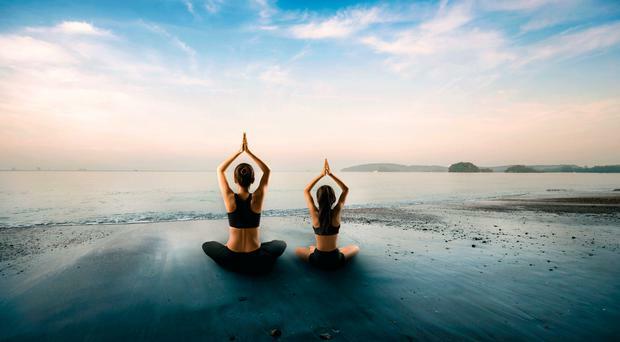 Dominique Antiglio, sophrologist, wellness expert and founder of dynamic meditation clinic BeSophro, recommends a very specific kind: "Sophrology involves a combination of relaxation, breathing, gentle body movement and visualisation techniques. It brings you into a state of dynamic relaxation, where the body is so calm that the heart rate lowers, yet the mind is clear and fully alert. This state immediately lowers stress levels more quickly and easily than other meditative practices, and over time, particularly during times of stress, the mind and body will naturally trigger this response to bring you back to a calmer state. "Because it engages both the mind and body, it has greater immediate impact during times of stress and anger. "The physical element is also ideal for young children, who may find sitting still for long periods of time difficult." You could also give 'raisin meditation' a go, says Eugene Farrell, AXA PPP healthcare's psychological health expert. Find a quiet spot where you can sit down and relax. Take a few deep breaths, then once you're comfy, pick up a raisin and hold it in your hand. Look at the raisin. Really concentrate. Let your eyes roam over the fruit and pick out all the details - the colour, areas of light and shade, any ridges or shine. Before moving on, you might want to close your eyes because this can heighten your other senses and help you focus. Touch the raisin. Feel its smallness in your palm. Explore its texture with your fingers. Is the skin waxy? Are there any edges? It is soft or hard? Smell the raisin. Bring it close to your nose and, with deep inhalations and exhalations, concentrate on any scents and fragrances. Does it smell sweet, or perhaps earthy? Has this triggered your tastebuds or made your tummy rumble? Taste the raisin. Place it in your mouth, noticing how your hand instinctively knows where to go. Don't chew yet, just spend some time concentrating on how the raisin feels on your tongue. Turn it over in your mouth and feel its texture on the roof of your mouth. Take one or two bites into the fruit, without swallowing it. Fix your mind on the sensations in your mouth. How does it taste? How does this develop as the moments pass? How has the raisin changed? Do the smaller pieces of fruit feel different? Hear the sounds you make as you chew it and swallow. Notice when you have really explored the sensation of the raisin in your mouth, notice your intention to swallow it and then follow with the physical action. If you can, track the sensation of the raisin going into your tummy. Take a moment to notice how your whole body feels. When you are ready, start to awaken your mind. You might want to move the hands and feet a little, slowly open your eyes and take a few deep breaths. With the meditation exercise now complete, you can carry on with your day when you're ready. "The word 'stress' has become so prevalent in the past couple of decades that it can't help but impact our thinking," says mum, wife and success coach Cori Javid (corijavid.com). "Feeling stressed can be a go-to response, even a habit we build over time, and if you find yourself using the word 'stressed' a lot, each time you are reinforcing that habit in your mind. When you realise this, it is possible to become more intentional about how you describing your feelings, which, in turn, can help you manage your emotional responses." Equally, when you use the words 'stress' or 'stressed' frequently, it can impact your family, as they become a regular part of the family vibe, she says. "Try banishing the word from your household vocabulary for just a week and notice the difference it makes."